Third parties, rather than Mr Delia, had personally placed mementos at the Great Siege monument. Manuel Delia’s juridical interest in the case he had personally instituted against the government over the persistent dismantling of the makeshift memorial to Daphne Caruana Galizia is being challenged. 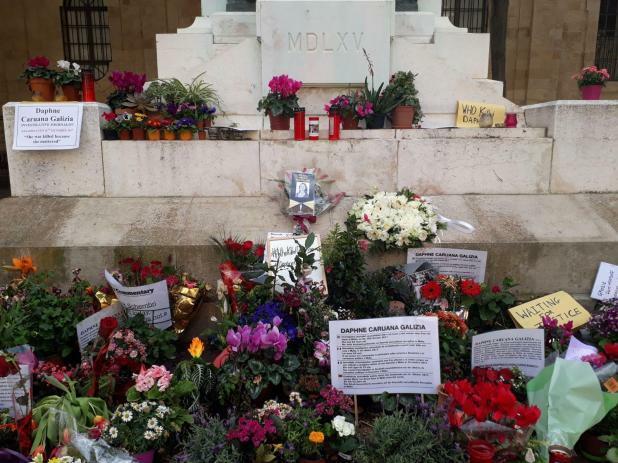 This was the latest twist in the constitutional proceedings filed by the activist and blogger against Justice Minister Owen Bonnici, after flowers, candles and photos placed at Valletta’s Great Siege monument following the assassination of Ms Caruana Galizia were repeatedly cleared away. Mr Delia claimed this amounted to a breach of his fundamental right to free expression, a right he sought to enforce by taking his constitutional grievance to court. Yet, a number of sittings and several witnesses down the line, the applicant’s continued juridical interest in the case is being questioned. Hours before proceedings were due to continue on Thursday afternoon, the applicant’s lawyers filed a note to declare they had no further witnesses to summon. However, as the sitting kicked off, the same lawyers had to change plans, seeking the court’s authorisation to withdraw their earlier note. What brought about that change of mind was a recent application filed by the respondents challenging Mr Delia’s juridical interest. It was argued that it had clearly emerged throughout the proceedings so far, that third parties, rather than Mr Delia, had personally placed mementos at the Great Siege monument. Reference was made to the testimony of Karol Aquilina, recalling how he had purchased candles to light at the memorial as a sign of protest. Another witness, Ann DeMarco had testified as to how she visited the site on a daily basis as one of a group of protesters who replenished items left there in protest. Mr Delia did not form part of that group, the respondents observed. A party in a suit had to prove he had an ‘actual and personal’ interest that existed not only when proceedings were instituted but also subsisted throughout the hearing of the case, the respondents said, arguing that this appeared not to be the case with respect to Mr Delia. In view of this fresh application filed on February 4, the First Hall, Civil Court, presided over by Mr Justice Joseph Zammit McKeon, adjourned the case to February 19 for a decree to resolve this matter. Lawyers Paul Borg Olivier, Jason Azzopardi, Therese Comodini Cachia and Eve Borg Costanzi are assisting Mr Delia. Lawyers Victoria Buttigieg and Chris Cilia are assisting the respondents.